Which stall has the best chicken rice in Singapore? Listing the famous chicken rice stalls in Singapore, we have Tian Tian, Wee Nam Kee, Hua Kee and Five Star, amongst many others. Each famous chicken rice stall has its own unique strengths. Yes, if you try them all, you will find that they are all very different in their taste and styles. As usual, being the food hunter that I am, I have tried all of them and my personal favourite is the chicken rice at Boon Tong Kee. The subject of today’s review is Boon Tong Kee’s main branch at Balestier. Including their main branch, they have a total of seven chicken rice outlets all over the island. Best Chicken Rice in Singapore? Tian Tian at Maxwell Food Centre has a very solid all round offering and I’ll probably peg it at second. They taste like the typical chicken rice except that everything is just done better. The rice is more fragrant, the chicken is more tender and juicy, and the sinful sesame and soy sauce concoction is just better. Wee Nam Kee at Thomson Rd comes in third with very nicely done chicken as well, but they have a different take for the rice, with a slight whiff of ginger and a stronger fragrance. Hua Kee at Redhill has a solid chicken offering as well, but their rice has less ‘oomph’ compared to the previous two stalls. Five Star on the other hand, is my least preferred stall. IMHO (in my humble opinion), that is also very subjective, Boon Tong Kee has the most delicious rice. It has the strongest fragrance and it is super addictive, especially if you combine it with their chicken rice sauce. Their chicken may fall short compared to some of the other famous chicken rice stalls, but the strength of their rice carries it for me. Boon Tong Kee’s kitchen is open and exposed for the world to see. On a Sunday night, I counted no less than 20 chefs and assistants in the kitchen. The main branch at Balestier serves the full course of Chinese cuisine. 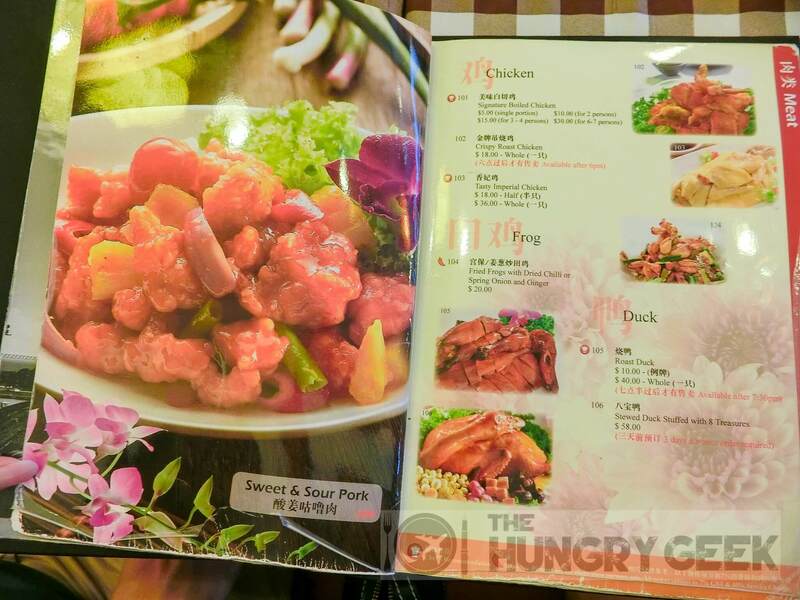 They have pages of different types of fish, pork and duck dishes as well as a plethora of vegetable and bean curd dishes. This seems more like a proper Chinese restaurant with good chicken rice rather than a specialist chicken rice stall. You may wish to use the service buttons on the table to get the attention of their servers, it is much more efficient than trying to get someone’s attention the old fashioned way here, especially on a busy weekend night. The other Boon Tong Kee branches elsewhere may have more limited menus. For example, the East Coast Rd branch has a significantly more streamlined menu. That branch serves all the signature dishes like the chicken rice and crispy bean curd but they leave out all the others. If you go to their main Balestier branch do make reservations if you can. Their reservation quota fills up fast and if you show up without a reservation on a weekend night, expect to wait upwards of 20 minutes. I have a particular philosophy with chilli. I dislike chilli being used to carry the flavour of a particular dish. The dish should be delicious on its own without chilli, and once you add the chilli, the taste of the dish is supposed to soar to even greater heights. I loathe foods that rely wholly on chilli to boosts the taste. That said, I love chilli that goes well with delicious food. So all the food that you see on this blog has to be delicious without chilli, and with the provided chilli they have to be even better. Boon Tong Kee’s boiled chicken rice (白鸡饭 bái jī fàn) is so good that you can eat the whole dish without a single ounce of chilli. The rice is the king with its super fragrant aroma that is so addictive when consumed with their special sesame and soy sauce concoction. The chicken is soft and tender and tastes the best when soaked in their special sesame/soy sauce. The chilli gives that added kick if you need it. We give this chicken rice dish a rating of 4.6/5, putting it in our coveted ‘The Ultimate Taste’ list. You can get their boiled chicken rice at S$5 for a single portion, S$10 for two people, S$15 for 3-4 persons, or $30 for 6-7 persons. The price does not include the rice, taxes or service charge. Don’t hesitate if you’re thinking about ordering a bit more chicken – I find their portion sizes a bit small. This goes for S$5, and we ordered it after seeing it appearing on so many tables around us. This definitely tastes as delicious as it looks, however if you’re unlucky you may get this a bit cold. It is prepared in advance during peak hours and served immediately – we were unlucky to get this at a temperature that was lower than we would have liked. The sauce is delicious and there is a ton of fat here, so remember to make the necessary specifications when you order if you don’t like the fat. We rate this 4/5 with the caveat that it would have definitely have received a higher rating if it came piping hot. I do not know why they had to list this as ‘deep fried bean curd’ in their menu. You do not want to remind patrons about unhealthy properties of a dish! If restaurants started to add the term ‘deep fried’ to stuff that was actually deep fried like the usual sweet and sour dishes, takings would plummet for those. That said, this crispy bean curd dish is one of their best items here (apart from their chicken rice) and you MUST order this! Virtually every table around us had this as well. The bean curd is made to the perfect crispiness. Dip this piping hot bean curd into the included mayonnaise and you will experience this heavenly feeling when you first bite into it. It is just the perfect combination. We rate this item 4.4/5. This goes for S$6. They added lard to this dish! It is a tad more spicy than we would have liked but it is still super delicious. We rate this dish 4.2/5 and it goes for S$10. This was actually given to ALL the diners FREE OF CHARGE! What a nice surprise. We rate this red bean soup 4/5. Yes, this is the best chicken rice in Singapore. By far the best rice with their sesame/soy sauce drizzle around the chicken. Come to their main branch at Balestier and try some of our recommendations – you won’t regret it. ← Tai Lei Loi Kei Singapore – Pork Chop from Macau! 328 Katong Laksa – One of the Twin Titans In "Singapore Hawker Food"